I won an Emmy last night. That’s me… the bald guy in the photo on the left, next to the incredible photographer Anthony Suau. 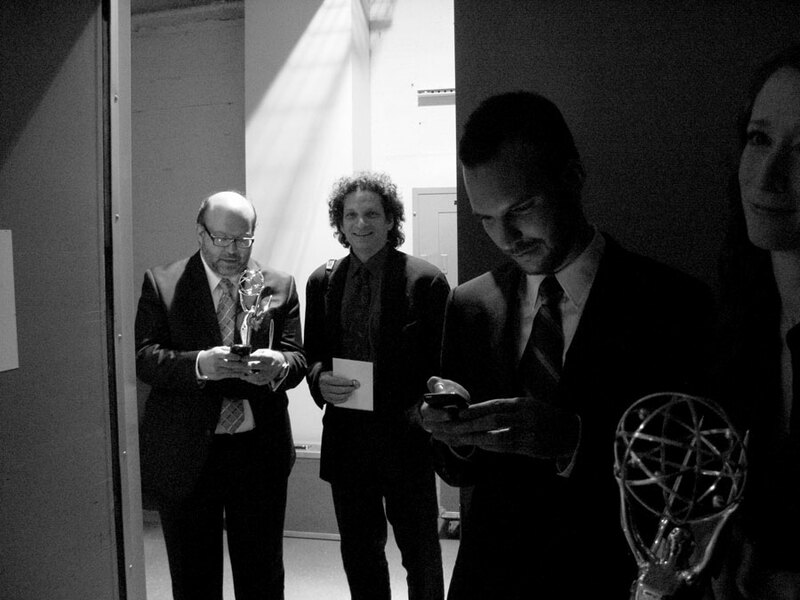 Pulitzer Prize-winning photographer Todd Heisler captured this shot of us on his point and shoot, as he and his colleagues (Meaghan, Tom, Sarah and Alexie) and I waited in line with Tony for our winners’ photo backstage at the News & Documentary Emmy awards. Of course Todd catches me working the blackberry. I’m texting and emailing TIME colleagues and friends, letting them know I won. The New York Times won for an amazing series they did called One in 8 Million, which chronicles the lives of interesting New Yorkers. It is a fabulous multimedia experience and well deserving of the honor. If I weren’t such a bashful and humble kid from Ohio, I’d say the same about my own Emmy-winning series on TIME.com, which earned the statue in a category called New Approaches to News & Documentary Programming: Arts, Lifestyle & Culture. The Iconic Photo series gives the back story to famous photographs, from the images from D-Day captured by Robert Capa to the amazing shots from the Berlin Wall that TIME photographer Anthony Suau (who joined me on stage last night) captured as the wall was being dismantled. Today, we featured the entire series on the TIME site. It’s an idea I came up with as a way to feature the incredible history of photography at TIME, as well as its sister publication Life Magazine. I love photography and photographers and how they can tell a powerful story in a single frame. There are so many amazing pictures that speak to us collectively as a culture, and the stories behind them are rich. Think of the photo lab guy in London, who gets so excited about Capa’s photos from a decisive battle on the beaches of Normandy, that he ruins them accidentally, cooking the negatives. Or, from that same war but on the other side of the globe, Abe Rosenthal arriving at the top of Mount Suribachi to see five marines and a Navy corpsman raising the flag over Iwo Jima; one of the most famous photographs in history. And I also wanted to create an editing challenge for myself: how could I bring these still images to life in a new way, on the modern platform of the web? I do it with interviews with people who know the images and their back stories well. Then I layer it with sound, using our ears — what a radio professor in college called “the theater of the mind” — to bring the moment to life again. To draw attention to details, rather than using fancy effects, I simply isolate a part of the photograph, then dissolve in the rest. I couldn’t be more pleased with the effect and impact these pieces have had. And to be recognized by the Television Academy for them is especially nice. At the awards dinner, Anthony — who as a young photographer was assigned by TIME to cover the fall of the Berlin Wall — brought his Leica 35mm camera and documented the entire evening — even snapping photos on the stage as I spoke (nervously reading my prepared little speech, and laughing at the sign on the table next to the podium that said “place Emmy here”). NBC anchor Lester Holt, who presented the award to us, asked Tony as we left the stage “Hey, did you get one of me?” I’ll look forward to seeing the images when he has the film (yes, film!) developed. 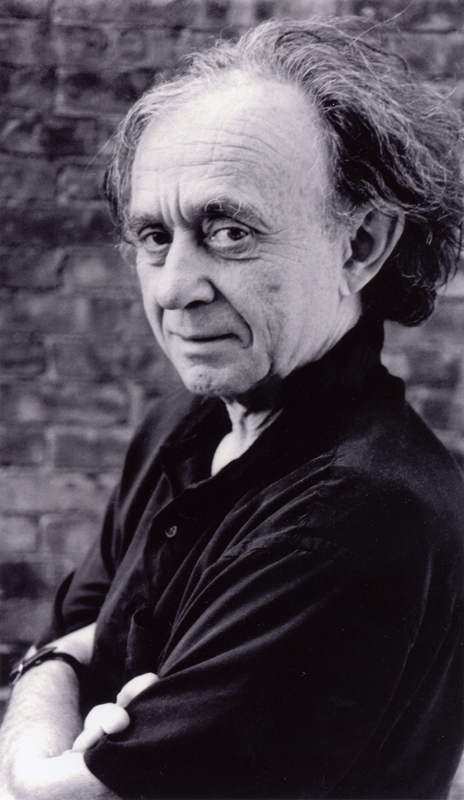 There are many favorite moments from the evening, the best was to be in the presence of a major hero of mine: the documentary filmmaker Frederick Wiseman (left), who was honored with the lifetime achievement award. Near the top of the list of moments was standing with the Emmy in my hand in the elevator next to Katie Couric — whose team, and CBS, won the most awards last night — and she turned around and said to me, pointing at the trophy, “Boy, I bet that thing is a real chick magnet!” I told her I’d go test it out. Instead, Tony and I just went to the Mandarin hotel bar, and drank champagne with our NYTimes friends, toasting the evening with that fabulous view of Central Park on a rainy New York night. Congrats on the Emmy, Craig!! Yay! That’s awesome, Craig! And the video series you created definitely deserves the honor. I love them. Well done, my friend! Well done!